The Citi Exhibition Manga was curated by our Research Director Professor Nicole Coolidge Rousmaniere, alongside our Senior Digital Humanities Officer Dr Ryoko Matsuba, and Dr Hiromi Uchida. Celebrating Japanese manga, art, fashion and design, this event includes manga drawing workshops with award-winning manga artist Kutsuwada Chie, music performances by Ichikawa Hibiki and DJ Takaki and a sake tasting. It will also feature a manga-inspired fashion show by students from the University of the Arts London (UAL) and Japanese fashion legend, Kansai Yamamoto (pictured). Yamamoto will be in conversation with Grayson Perry on the night (see online for details). Japanese food and drink will be available to purchase in the Great Court. Presented in collaboration with Japan House, Arts SU and UAL students. Free, just drop in. Details here. Deepen your understanding of Japanese culture by embarking on a four week Japanese language course presented in collaboration with City Lit. Join professional manga artist Kutsuwada Chie for a day-long practical introduction to drawing Japanese manga. Ticket price includes refreshments, materials and entry to the Citi exhibition Manga throughout the day. Uchida Hiromi, Matsuba Ryoko and Nicole Rousmaniere give an introduction to the exhibition. Includes live subtitles (LS) for deaf and hard-of-hearing audience members. What are the origins of manga? Is the Great Wave print by Katsushika Hokusai (1760–1849) the first example? A key work in Hokusai’s career was Hokusai Manga, a series of 15 printed volumes of his ‘random sketches’. But did the term manga mean the same as it does now? Tim Clark, co-curator of the 2017 exhibition Hokusai: beyond the Great Wave, sifts the evidence. Roger Sabin, author and Professor of Popular Culture at Central St Martins, University of the Arts London discusses Duval’s life and works. Kassoumah Obada grew up with his friends in Syria watching the popular anime Captain Tsubasa and dreaming of becoming a professional football player. He is now translating the Captain Tsubasa manga into his native Arabic. His translations are being distributed in Syrian refugee camps and proving a huge hit. There’s much more to Asian comics than manga. Widen your horizons with international comics expert Paul Gravett (pictured) as he examines the unique factors which have helped to make Japan the home of the most dynamic and influential comics culture in Asia. He also positions manga in its wider Asian context, revealing the fascinating connections and contrasts between the medium’s diverse forms across the continent. Followed by signing of Mangasia: The Definitive Guide to Asian Comics. A lunchtime lecture about Osamu Tezuka by Helen McCarthy, author of The Anime Movie Guide. Tezuka made his debut as a professional manga artist in January 1946, and became a superstar a year later with the publication of his first longform comic New Treasure Island (Shin Takarajima). Find out how Tezuka helped to drive the postwar revival of manga and the development of the Japanese comic into a global phenomenon. Uchida Hiromi, Matsuba Ryoko and Nicole Rousmaniere give an introduction to the exhibition. The event on Thursday 1 August includes live subtitles (LS) for deaf and hard-of-hearing audience members. With Alfred Haft, British Museum. With Uchida Hiromi, British Museum. With David Green, British Museum. A gallery talk by Matsuba Ryoko, British Museum. With Helen McCarthy author of The Anime Movie Guide and Hayao Miyazaki: Master of Japanese Animation. Explore, discover, listen and make this half term! Activities are held in the Great Court and Galleries from 11.00–16.00. Be inspired by the Citi exhibition Manga to help create a giant comic page – and try your hand at mark making and bold lettering. Discover the magical world of manga in this exhibition-based session. Immerse yourself in a rainbow of colours and create a memento to take home. Everyone loves a good story. In this session you’ll explore manga, join in with storytelling and create your own props to take home. Discover the exciting characters in the world of manga. Explore the exhibition, try your hand at dressing up and make a mask. Join Lonny Evans for this live description tour of the exhibition. Join BSL art guide Chisato Minamimura for this deaf-led tour of exhibition highlights. In BSL, no voice-over. Minamimura leads a deaf-led introduction to and creative workshop inspired by the exhibition. In BSL, no voice-over. Includes access to the exhibition but not a tour. Acclaimed manga artist Takahashi Yoichi creator of the football-themed sensation Captain Tsubasa and exhibition curator Nicole Rousmaniere discuss the global impact Yoichi’s artwork has had over the past four decades – from popularising football in Japan in the 1980s, to inspiring Syrian refugee children. The panel also includes leading manga editor Suzuki Haruhiko. Renowned manga editor Nakaguma Ichirō, curator Nicole Rousmaniere, award-winning British manga artist Shangomola Edunjobi (pictured) and other special guests discuss the importance of human expression and rights in the creation of manga, as well as questioning ‘what makes a good manga artist?’ Presented in collaboration with the Embassy of Japan. Human history is full of examples of comic book-style storytelling, where scrolling and sequential narratives are used to tell epic stories. From the lion hunt reliefs of ancient Mesopotamia to prehistoric cave paintings that could be considered the original precursor of manga, humans have long used pictures to communicate their greatest stories. This phenomenon is charted in this panel discussion, chaired by international comics expert Paul Gravett, with curators from across the Museum and guest artists. a glass of sake. Courtesy of StudioCanal. Booking details to be confirmed. This acclaimed tale follows two sisters settling into an old country house as their mother recovers from an illness. As they explore their home, they encounter playful spirits, most notably Totoro. Followed by Q&A with curator Nicole Rousmaniere and anime expert Helen McCarthy. Follow the mythical tanuki’s battle to save their forest home from development. Followed by Q&A with Director of Programming at Japan House, Simon Wright, and curator Matsuba Ryoko. A tiny nymph found inside a bamboo stalk grows into a beautiful and desirable young woman, who orders her suitors to prove their love by completing a series of near-impossible tasks. Followed by a Q&A with author of Anime: A Critical Introduction, Rayna Denison, artist Hosono Hitomi and Museum curator Nicole Rousmaniere. Image: Konami Kanata (b. 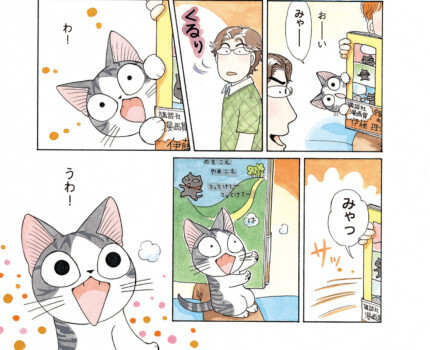 1958) Chi’s Sweet Home (2004 – 2015) © Konami Kanata/Kodansha Ltd.